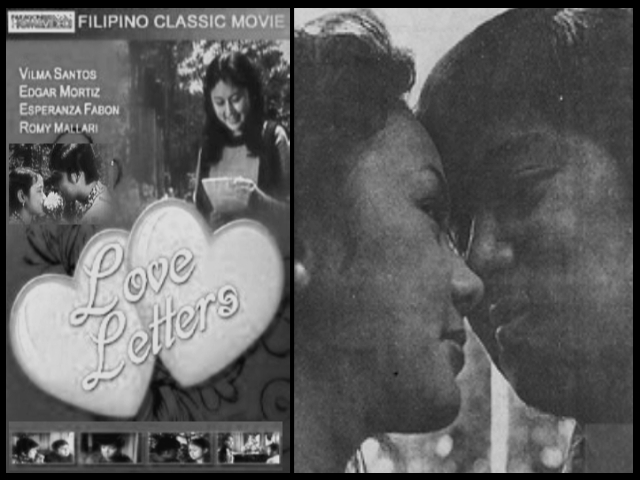 The Reviews: Love Letters started with Vilma entering a living room and Baby De Jesus started playing the piano. Suddenly, Vilma started singing and after finishing her song, she left the room, while a very young Alona Alegre sitting beside her appeared to be in her own world, as if she heared, nothing. There were no interaction between the three, no dialouge, making this opening scene quite irritating. The next scene, we found out that Edgar, played by Edgar Mortiz is a Filipino-American. We assumed that he is vacationing and taking some course. Next scene, Victor Wood is singing on the telephone while Alona Alegre is listening on the other line. Then it Edgar turn to sing. This time, in the men’s dormitory followed by Baby De Jesus. Her limited dialouge: she wanted to sing “to entertain Vilma.” Then Edgar and Vilma are set to meet in a park but because Vilma was so late, Edgar decided to leave. When she arrived and found no Edgar, she started to cry and ofcourse, she sings! Not to be outdone, its Romy Mallari’s turn to sing! Then its Edgar turn to sing again. Edgar got so mad with Vilma and decided to return all of Vilma’s love letters. In protest, Vilma returned his gift, a ring and bracelet. Afterwards she sings the theme song, “Love Letter.” She followed this up with her day dreaming scenes, remeniscing the time when the two of them are singing in the park. She then fell asleep but was awaken by an intruder! Presto! It was Edgar! Stealing their love letters! He escaped when Vilma’s parent caught them talking. The next scenes was a courtscenes. Vilma and Edgar plus Vilma’s parent testified in front of a judge. A phone call from the mayor who is connected to Edgar postponed the judge’s decision. As turned out, Vilma’s parent also owned some love letters which made them understand what their daughter is now going through. At the breakfast table the next day, Vilma all of the sudden proclaimed that she doesn’t care about Edgar anymore. Then they discovered that Edgar and his friends decided to have a picket line in their house (ala-“Occupy Wall Street”???). They decided to remained in the picketline over night with more singing. Sleeping outside, the girls headed by Alona Alegre, decided to join the picketline. Vilma’s parent confronted them and Victor Wood all of the sudden declared that he wanted to marry Alona Alegre! And to add to the drama, Edgar decided to leave the country. The next scenes was Vilma receiving love letters over time. Then finally the promised wedding of Victor Wood and Alona Alegre, Edgar then seranade Alona and Victor. When Vilma heard and saw Edgar, she run to the church’s balcony. They reunited with a duet! The End. 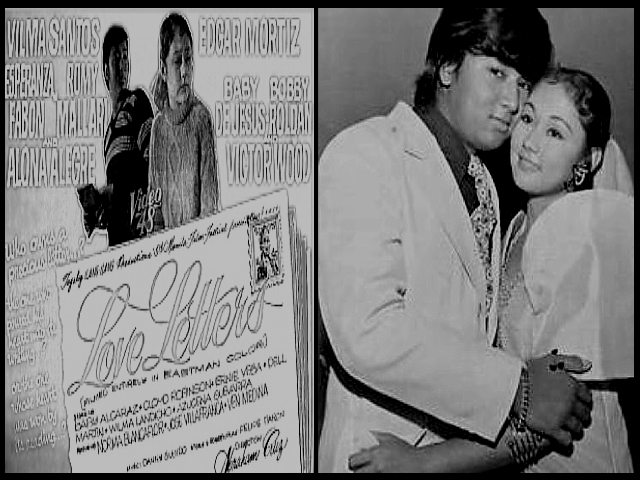 This entry was posted in ARTICLES, FILM REVIEW and tagged Alona Alegre, Baby DeJesus, Esperanza Fabon, Love Letters, philippine movies, politician, Victor Wood, Vilma Santos, Vilma Tuazon. Bookmark the permalink.